Perhaps you’re looking for a camping bed, maybe you’ve heard of Therma rest ( thermarest ) , or are considering a camping air mattress, a cot, or making your own camping mattress out of sponge or blankets and sleeping bags. Have you thought of being different, and sleeping in a hammock!?! The camping bed that I use, and that I consider the best camping mattress overall, is a Therma rest. Well, actually I use a Thermarest knock-off, a Mountain Equipment co-op version of the same style as a thermarest , but I’ve slept on both. This is my favourite kind of camping mattress because it’s lightweight, packs up small, is quite comfortable for the thickness, and are quite hardy/ durable. Plus, it partially self-inflates which is pretty great and saves your lungs!!! How it is made? A Thermarest is a sponge inside of a ‘plastic sheet’ with a small valve that allows air in. What happens, is that after the thermarest is opened up, the sponge wants to expand (as sponges want to do), and so air is sucked into the mattress. Then, you blow a few more puffs of air into the camping mattress, and it’s full! Once you’re finished, to roll it up, you open the valve and roll the therma rest up and all the air comes out. Pretty niftty! This is why I love my Thermarest . I’d recommend the Therma rest (as that is what I personally use). A Therma Rest is worth the money in my opinion. You’ll use it for the rest of your life. They are more pricey than some of the options below and cheaper than others. They are a great middle of the road, last a long time mattress. I’ve used most of the ideas below, and can say that you can get a decent nights sleep, cause a day of fresh air makes you that much more tired so you appreciate ANYTHING soft, even if it isn’t as soft as your super comfy mattress at home. Read reviews or purchase your own Thermarest now! 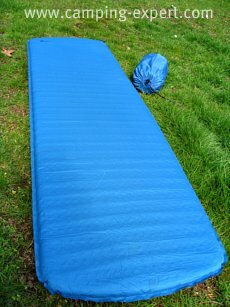 Another Thermarest Mattress, but lighter and packs up smaller than regular therma rest camping mattresses. This camping bed keeps you off the ground, and thus warmer at night. The mattress is made by triangular baffles inside the mattress so air does not flow. Like a high tech beach mattress. You’ll notice it by it’s bright yellow, fancy, high tech fabric! The latest, fancyiest, comfiest camping sleeping experience. Exped makes 3 camping mattresses that are thick and warm against the ground. This Camping bed is filled with either down, foam or synthetic material. The inner material will determine the price. To pump, you use the built in pump (or pillow pump for the lighter weight mattresses) which forces air into the mattress so you don’t use your lungs. I’d describe it as a cross between the NeoAir mattress and a sleeping bag. I have heard of some people switching from the regular Therma rest to the Exped mattress, so this must mean good things!! Overall, they looked pretty decent to me. Read reviews or purchase the Exped now! Add a nice extra cushion against rocks and pine cones. Not affected by water- in fact will help protect your sleeping bag from ground wetness. Can be used at the beach as a water mattress. Good for pets, as their paws won’t ruin it. Doesn’t compress to pack up as small as the thermarest camping bed. Somewhat protects your sleeping bag against water. Not as durable as blue foamy as the bubbles can pop. Various prices- can get cheaper ones, although they don’t last as long as camping air mattresses. Can used at the beach during the day. Can get a hole, which may be hard to find and repair. Not good for pets or ground with sharp rocks. Pros: More durable than regular air mattresses. Can bring to the beach during the day. Multipurpose- Can use as a guest mattress when people over at your house. Cons: Need a pump or a lung or two full of air. Can get punctured, leaving you with no cushion. More expensive than cheap air mattresses. Plastics are heavy- not good for interior or as a back country camping bed . Pros: Cheap- you probably have a few extra sleeping bags, or blankets around the house. I’ve used this option in a pinch- no need to go shopping. Quite comfortable, especially for the price. Get dirty pretty easily, so need to go in the wash when you’re finished camping. Get wet and hold water. Pros: Very comfy- I know people who have used them as temporary beds in their house. Not super heavy (if dry). Keep you off of the ground. OK price- For a base camp, you can purchase military cots for decent prices at surplus stores. Pros: Can get very large comfy hammocks made with parachute material so lightweight and strong. Can get them integrated with hood and nets for bugs (ie. Tent and bed in one). People will be jealous of your cool bed! Cons: not as warm as a pad, as the air flows under you. Can be a bit expensive (sometimes you can find deals), but overall is cheaper if you’re using it as a tent too. Must have 2 trees to use it. Read more about camping hammocks. What Do You Sleep On When Camping? Do you love your Thermarest? Are your camping slumbers amazing? Share your camping bed secrets! Click here to see the rest of the form and share your sleeping secrets. its used to do my sit ups on .